May the fragrance of our noble flower guide our unfailing community together for an elegant and immersive evening of celebration and honor. 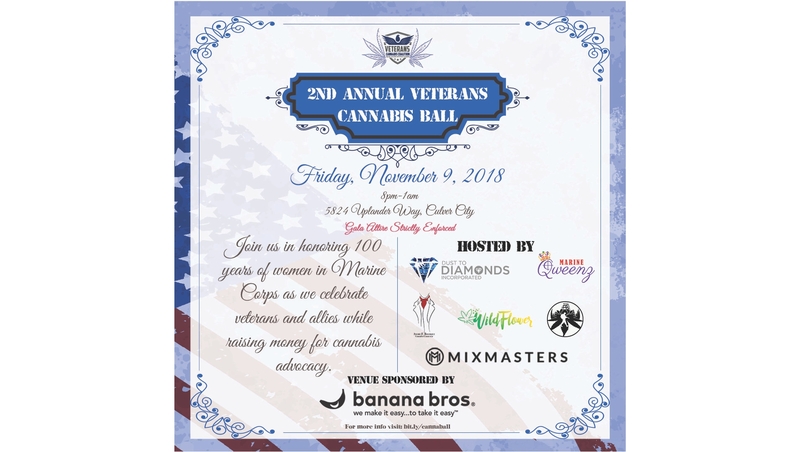 The Veterans Cannabis Coalition and Dust to Diamonds, Inc. present the 2nd Annual Cannabis Ball. Generously hosted by OTTO by Banana Bros, this is a night we observe the natural relationship between veteran men and women who served our country, and the cannabis they require to treat post-war illnesses and conditions. Enjoy two adjacent lounges, each offering their own unique, immersive experience. In honor of the 100 year anniversary of Opha Mae Johnson, the first female U.S. Marine, five veteran women will be selected prior to the event to receive a full makeover, including professional make-up and hair styling. Producers and sponsors include Mixmasters, Arcane Revelry, Marine Qweenz, Veterans Walk and Talk, WildFlower Consulting, the California Cannabis Coalition, the California Minority Alliance: IE Chapter, and Andre F. Bourque. This event is 21+ over with a valid photo ID. The dress code for the event is black tie optional/semi-formal (men: tuxedo or suit with tie, women: evening gown or cocktail dress). Dress to impress!